I wonder if this is what it feels like to go crazy. Not a little zany, not idiosyncratic, but utterly, looney bin nuts. Recently, the U.S. Department of Energy (DOE) Secretary Moniz announced that our government has approved a $6.5 billion loan to Southern Co. to build two new nuclear reactors at the Alvin W. Vogtle Electric Generating nuclear site in Georgia. Yes, new nuclear – on our own soil. With Fukushima radiation bombarding the Pacific Ocean and California turning into the land of slow-roast, and radiation poisoned citizens carrying Geiger counters while their cancer rates go through the roof, our administration has decided to build more nuclear power plants. And – they are going to do it with our money. It is the first loan to begin nuclear construction in 30 years. The plans were already under way four years ago – well before the Fukushima disaster had begun, but in consideration of the incredibly disastrous affects of this singular nuclear meltdown, one would think that our government would reconsider. Solar and wind power have made enormous strides not just in the US, but elsewhere. Those industries have now provided more high paying jobs than the national average, and coal and oil jobs combined. In Georgia, where the plants will be built, solar jobs have more than doubled in just the past year. That’s my mistake though – assuming our government officials were acting on logic. We clearly aren’t dealing with sane individuals anymore, though perhaps we never were. 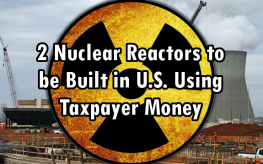 Billions of taxpayer dollars will now fund our own deaths through radioactive isotope exposure. Should this be called euthanasia or suicide? Do I refer to it as mass murder, or robbery? More than 30 environmental organizations filed a petition early last month asking the Nuclear Regulatory Commission to hold off on issuing any more reactor licensing based on the devastation of Fukushima, but is anyone up in Washington listening? Why do 30 different organizations need to point out what is absurdly obvious and Kafkaesque? These actions could mean nothing else but that our governments are fully aware of the risks of nuclear energy, and don’t give a damn if we all die of caesium-induced heart attacks, or our livers and brains rot from depleted uranium and strontium exposure. Between Iraq, Afghanistan, Chernobyl, and now Fukushima, just to name a few big ones, they’ve managed to kill millions. Why are they not all in jail? We in the USA have become sheep’s to be fleeced and sheep for the slaughter. Can you say baa’s and mehs?! Just what we need, more nuclear waste, and being more susceptible to foreign invasions. They have never cleaned up nuclear waste in this country, what makes them think we believe they will clean it up now. A lot of money is passing hands in government on this one. Maybe one day we will stand up for our rights, but not any day soon it seems. Hey Mike! Make another petition that we no longer invest taxpayer dollars in nuclear and other non-renewable or toxic energy platforms. I’m pretty sure you won’t find a person who wouldn’t sign that.